Are you looking for a sturdy but handsome writing instrument? Not only are Lanier’s Cigar Style Twist Pens a pleasure to use, but they are built to last a lifetime. Fashioned after a Parker Pen, each of our Cigar Style Twist Pens are made from the finest exotic woods, and can be trimmed with 24kt Gold plating or Bushed Satin. Our Cigar Style Twist Pens are built for comfort, and many people who want a larger size pen to use every day, and collectors who appreciate the beauty of a handmade wood pen, enjoy this fine writing instrument. 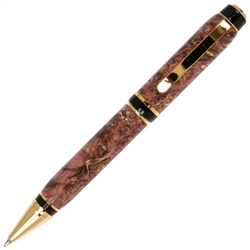 Exquisite is the word you’ll hear used by anyone who owns a Cigar Style Twist Pen from Lanier. Not only can you own a Cigar Style Twist Pen, but you can customize it so it’s really your very own look! You can have the Parker ballpoint made out of any of the more than sixty hardwoods grown in forests from around the world. If you have dreamed of owning a writing instrument made out of wood from Australia, or exotic hardwood from Asia or Africa, you have your choice of wood. Each pen is hand turned and then hand polished and coated with a permanent gloss finish for everlasting beauty and durability. Lanier’s custom made wood cigar pens are available in a range of plating options for you to choose from so you can enhance the beauty of the wood. Every pen features a smooth operating twist activation mechanism, and the very popular Parker-style ballpoint refill. You simply twist the pen to right or left and you’re ready to start writing. You will have the options of selecting both Black or Blue ink and a fine or medium sized Schmidt P900 Parker style ball-point refill. You can personalize your Cigar Style Twist Pen for yourself or as a gift, by having your pen engraved, in addition to a Rosewood gift box. You can also order a matching Cigar Style Twist Pencil so that you will have a custom made matching pen and pencil set to make your gift or collectible even more special.